Edinburgh: for William and Charles Tait, and Longman & Co, London,, 1825. with a sketch of the rise and progress of the science. Octavo (218 x 128 mm). Modern tan full levant morocco, contemporary red morocco label reused, flat bands ruled in gilt, central tool to compartments gilt, edges speckled brown. 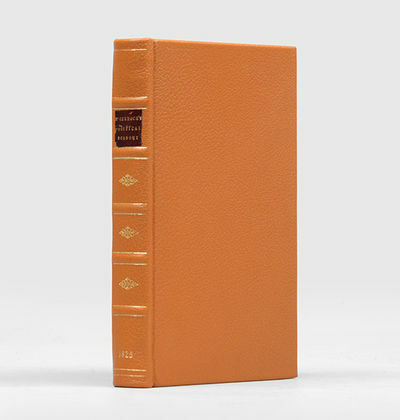 Bound without the half-title and publisher's ads. Faint spotting to endleaves. An excellent copy. First edition of the author's first major work, expanded from his contribution to the 1824 edition of the Encyclopaedia Britannica, "the first substantive text on political economy to appear in the encyclopaedia" (ODNB). David Ricardo, with whom McCulloch corresponded since he started taking an interest in political economy as a young man, described the article as a "valuable historical sketch" and "clear exposition of all the important principles of the science that you have left nothing for me to wish for" (P. Sraffa and M. H. Dobb (eds. ), The Works and Correspondence of David Ricardo, 195173, Vol. 9, p. 275). The Principles of Economy enjoyed a wave of popularity soon after publication and went through five editions but was supplanted in the late 1840s by John Stuart Mill's work of the same title. McCulloch's discussion on profit and interest with regards to a cask of wine is still used today to illustrate the labour theory of value: "Suppose, to illustrate the principle, that a cask of new wine, which cost £50, is put into a cellar, and that, at the end of twelve months, it is worth £55, the question is  whether ought the £5 of additional value, given to the wine, be considered as a compensation for the time the £50 worth of capital has been locked up, or should it be considered as the value of additional labour actually laid out in the wine?" (p. 313).